Just like people hoping to be discovered, companies need to advertise so consumers will know they exist. What happens in the minds of consumers is the same as what happens in our own minds when we want a particular product or service. We remember what companies we know about to get that product or service and weigh our options. If we can’t remember, we do an online search for “where to get ____ near me” to see what comes up. Companies who want to increase their chances of success need to be remembered by those willing to buy whatever they sell. They also need to be easily found online. Then, when consumers are ready to purchase, companies who have advertised have a greater chance of getting their business. Otherwise, many times their money goes to competitors. Countless analogies could be used to help illustrate this point. For example, if a single person who wants to meet and go on dates with other single people never lets anyone know they are single and want to go on dates, chances are highly unlikely that another person is just going to show up at their door and ask them out. 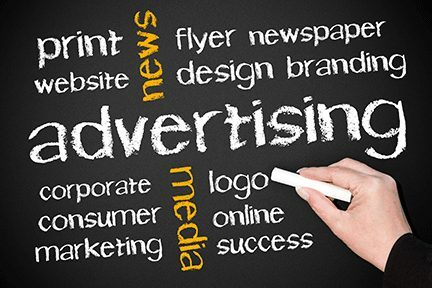 Being in advertising, we see numerous success stories of companies who advertise and continually do well. It isn’t the only reason for their success, but they understand how important it is for them to advertise. Sadly, we also see companies struggle and go out of business often because they don’t advertise. Not advertising may not be the only reason for their struggles, but it is too risky for a company to just hope consumers will find them, especially if their competitors advertise. In the digital world we live in, consumers regularly search online and read reviews while making purchasing decisions. A company’s digital presence is powerful, but print advertising is powerful as well. Coupons are attractive, and consumers find many stores and restaurants because coupons draw them in. Also, print advertising can be used as part of a sales funnel to attract consumers to websites, reviews, social media pages, and into the doors of business locations. Once there, the chances of a consumer making a purchase increase dramatically. Companies who don’t want to advertise with coupons often do well with exposure ads. Again, being remembered by consumers increases a company’s chances of getting their business when they are ready to purchase. Sales funnels are proven to be effective, and coupons in print advertising are popular. As for digital advertising, individual businesses are mentioned all over the internet in listing sites like Yelp, Bing, Yahoo, TripAdvisor, and Yellow Pages. Truthfully, many times the actual businesses don’t have anything to do with how their company is listed or how many digital locations their company’s listings are in. Having listings in business directories all over the internet is important for SEO rankings and exposure. Local SEO is notably affected by business listings, and it is extremely important for a business to have accurate and consistent listings in as many directories online as possible. Then, when consumers search for where to find a particular type of product or service, companies with accurate listings pop up. A business having its name, address and phone number listed the same all over the internet ensures Google knows that business and its address. If there is a variation, Google gets confused. If Google sees a business listed with different names, addresses or phone numbers, it thinks that each must be a different business, which decreases SEO value. Make sure information about your business on third-party sites is correct. Have accurate information on as many third-party sites as possible. Receive online reviews and have them posted on Google+ and other review sites. Continually add relevant content to your website. Post regularly on social media pages to interact with others. Companies who advertise in print and online usually make profits over time directly associated with their advertising, or at least don’t lose money because of it. Principles that support consistent advertising have proven to effectively create success. Of course a company’s revenue also depends on customer service, the quality of their products or services, location, demand, prices, and other factors. It also needs to be stated that sometimes companies who advertise never really know how successful their campaigns are, but whatever helps consumers remember them increases their chances of making sales. The Rule of Seven is real and true. A business who chooses to advertise in print and online is usually better off for it. With classy design on thick, glossy paper, our mission is to connect advertisers with consumers by distributing the most attractive direct-mail print advertising magazine available. Our goal is to create and maintain strong relationships with our advertisers, and we truly care about their success.